I got a little something for you’s! Hey, Matt Cosier just dumped these on my desk, and I gotta move 'em quick sticks, so if you're in Melbourne, Australia, drop by the office and pick up a copy, it's a top book. I'll leave them at reception...There's only one catch though, you have to post a book report on my blog after you've read it. A great introduction for intermediate-to-advanced developers into the powerful features and cool new functionality in Office 2003. This book is a ‘lil pocket rocket that offers clear and deep insight into leveraging the document object models in word and excel. The Essential guide to Office Development also shows you how to use SmartTags and XML to easily create integrated front end applications in Office that reuse your enterprises backend web services. 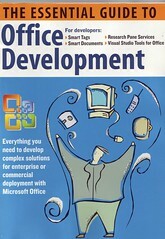 This book also offers an awesome 101 on extending Office with Visual Studio.Net and programming in VB and C#.